In June, Lenovo had launched Lenovo Z5, Lenovo K5 Note and Lenovo A5 smartphones. It appears that the Chinese manufacturer is now getting ready to launch a new mid-range phone in the near future. A new Lenovo smartphone with model number L38031 has surfaced on TENAA along with its specifications. The dimensions of the Lenovo L38031 are 153.8 x 72.9 x 7.95mm and it weighs 149 grams. The handset has a simplistic design and it seems to feature a tall aspect ratio display. The upper bezel of the phone appears to be fitted with dual front-facing cameras. On the backside of the Lenovo L38031 is a fingerprint reader and a horizontally arranged dual camera setup. The handset is likely to be available in China in colors like black, blue, silver and gold. The device features a 5.7-inch display that produces HD+ resolution of 720 x 1440 pixels. An octa-core processor that works at 2.0 GHz is present under the hood of the smartphone. 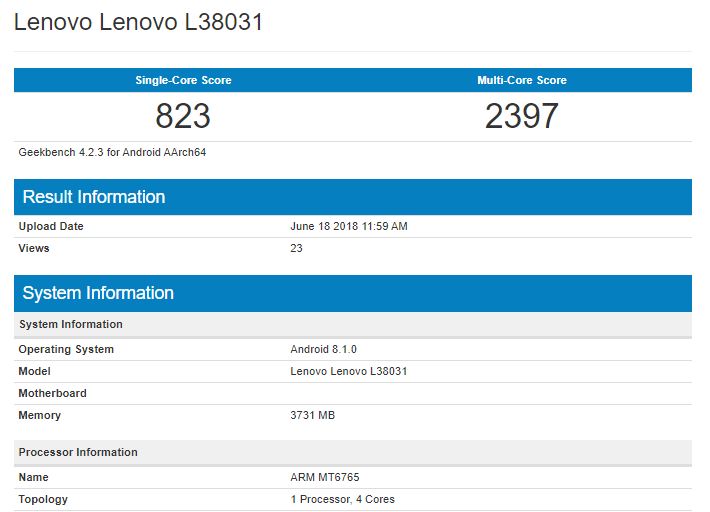 Last month, the smartphone was spotted with unannounced MediaTek MT6765 SoC on Geekbench. It appears that the handset may get introduced in three variants such as 16 GB storage + 2 GB RAM, 32 GB storage + 3 GB RAM and 64 GB storage + 4 GB RAM. It features a microSD card slot. The configuration of the dual front-facing and dual rear cameras is not mentioned on TENAA listing of Lenovo L38031. It only states that the front and rear camera setups include 13-megapixel primary sensor. The handset is packed with 2,970mAh battery. It’s worth mentioned that the same model has also been certified by China’s CMIIT and 3C.